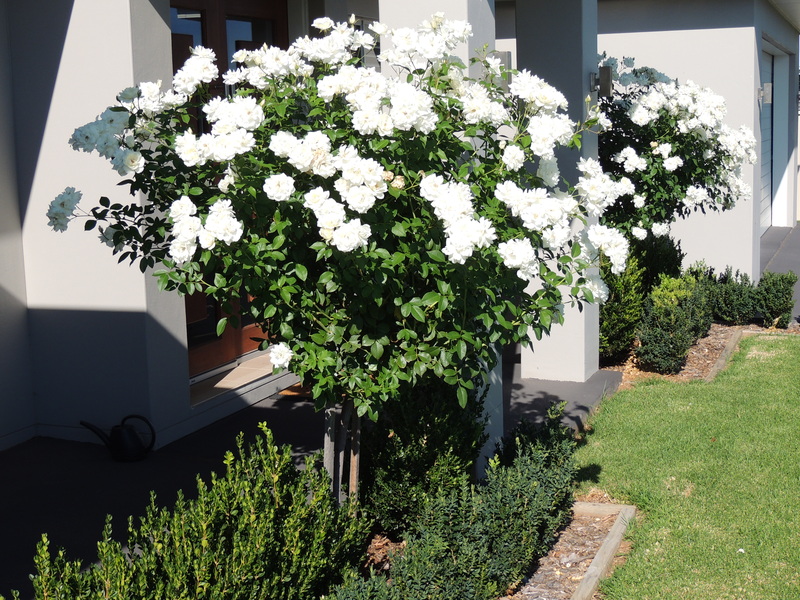 Iceberg roses are found all around Australia, often in their standard form, gracing front gardens. I have inherited two in my front garden on each side of the door, standing sentinel like Hans Christian Andersen's Steadfast Tin Soldier. And constant they are, flowering for many months of the year, and requiring not much more than a feed and a water even in the harshest summer. They flower prolifically. The flowers tend not to be very big, but what they lack in size, they make up for in abundance. I find that once the current crop of flowers is spent and I cut the rose back into the shape of a large cob loaf, new growth will spring up and before too long another white blizzard appears. This rose is one of my favourites. Some people think it's over-represented in gardens, but I think its reliability puts it right near the top of the list. It's quite resistant to rust, for one thing, and I don't think I've ever sprayed mine. The Iceberg was developed in Germany in 1958, and also comes in pink and burgundy these days. I've grown the burgundy iceberg and it's just as hardy. When we lived on our olive farm we had iceberg roses in the garden along the front of the house. They also performed well and it gave us much pleasure when we arrived late on a Friday after a long trip from Sydney, to see them there. Better still, kangaroos seemed to disdain them, although they would eat plenty of other plants in the garden especially if they had grass-like leaves. as we less patiently had for our reunion. Do you have a favourite rose? There are so many beauties it's almost impossible to choose, but I'd love to hear about yours. If you would like to follow my blog, you can put your email address in the box at the right-hand top of the post, and you'll receive posts direct to your inbox. Beautifully worded again. One of my favourites as well, Jane. I think the white rose you describe was the one planted in front of my old apartment balcony many years ago. When I moved to that un-renovated dark, damp (as I found out) apartment, the white rose seemed to carry enormous bundles (about 20 blooms) of the flowers and it seemed to bloom nearly all the year. When I left that home location in 2015 it was just starting to come back to its former glory, after years of minimal flowers. What a shame you couldn’t take it with you Vicki. Hi Jane, large pale flowers illuminated be the moon, or headlights, are lovely. I’ve posted twice about white flowers in the light without even realising! Obviously must mean something to me too. The Icebergs are beautiful. My mother-in-law had several in her garden. We have trouble growing roses as we don’t have time to spray. Sadly, my mother-in-law is no longer with us. When she was renovating, we dug up from her garden a rose called Fragrant Cloud. It has the most beautiful scent. It is still hanging in there in our garden despite the neglect. I think of my mother-in-law every time I smell it. I’m not surprised that they are your favourites, they are magnificent specimens. Nice to find your Australian blog and to see some lovely roses. What magnificent specimens. I can see why you are so pleased with them. Lovely to see your beautiful sunshiney garden on a cold winter’s day. Jane I like your story and your husband’s poem. They’re beautiful specimens, and clearly get on well in your garden as well. What more could you ask for?